What Day Of The Week Was April 11, 1981? 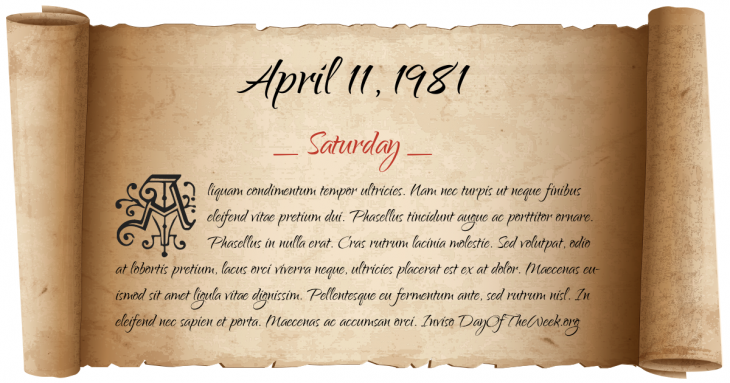 April 11, 1981 was the 101st day of the year 1981 in the Gregorian calendar. There were 264 days remaining until the end of the year. The day of the week was Saturday. A person born on this day will be 38 years old today. If that same person saved a Half dollar every day starting at age 3, then by now that person has accumulated $6,397.00 today. A massive riot in Brixton, South London, results in almost 300 police injuries and 65 serious civilian injuries. Who were born on April 11, 1981?